Best viewed in "Internet Explorer". 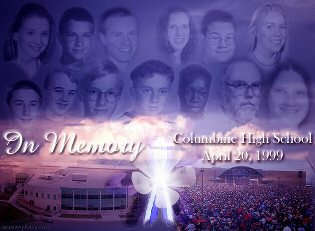 The Angels Of Columbine high. 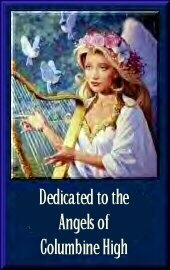 This Is A Prayer From "The Angels Of Columbine High", To "The People Of Littleton, Colorado"..
All those things I dearly love. So trusting and so true, Though there were times you did some things, you know you shouldn't do. To see another beautiful tribute to Columbine HS by Me, click the LINK below. Best viewed with later version of Netscape or Internet Explorer. Live beautiful java-applet on the page. Press your "BACK" button to return to this Page. Click Here. What happens when I click on the �Donate Free Food� button? Does the donation cost me anything? When you click on the �Donate Free Food� button, this registers with our computer server. The computer adds your food donation to the day�s totals and sends you the �Thank You For Your Donation� page. This page shows you the name of the sponsor or sponsors who pay for your donation. There is absolutely no charge to you for the donation; it is fully paid for by the sponsors and is completely free for you. The donated food is distributed through the United Nations World Food Program, the world�s largest food aid organization, with projects in 80 countries. They also work in conjunction with a number of other relief organizations. A list of many excellent relief organizations can be found on our Resources page. From A Filipina's Beautiful View. RELATED LINKS "They Weren't Normal"
CSPV Center for Study and Prevention of Violence. Info on violence prevention. This The Columbine Incident site owned by John M.Pinto. Click The Banner To Get To My Main Page.